September is National Preparedness Month and is certainly a good month for that, with 8 million people without power in Florida alone in the wake of hurricane Irma and more storms brewing in the Atlantic. In addition to natural disasters, black-outs may arise from simple equipment failure. The massive 2003 blackout was caused by a programming error which allowed a local overload to spread throughout the Northeastern U.S. and parts of Canada. The computer programs that control the grid are also susceptible to attacks by hackers in case of a cyberwar. No power means no refrigerator. No airco when it’s a 105 degrees in the shade. No internet. Nothing to watch on the tube. No light to read by, Or to cook by. Nothing to cook anyway, because of the fridge. Anybody who has ever been through a power outage knows that the fridge is the first concern. What would it take to keep the fridge going? Fridges built before 1990 consume about 600 watts per hour. Modern fridges use about 50 watts per hour. A regular gas-powered generator could easily provide that and more. But they can’t run 24/7 and if you’d store enough fuel to get through more than just a couple of days, you’d be living on a bomb. And there is of course the fossil fuel issue, which is allegedly a contributing factor in the formation of grid-downing storms and other environmental unpleasantnesses. The obvious alternative is solar energy. Like everything else in life, solar energy has its issues too. One of the bigger ones is that the yield of regular silicon-based solar panels decreases above 25º centigrade – that’s eh 77º Fahrenheit. That is wintry in the Sonora. At a 100 degrees, their efficiency drops to zero and the number of 100º-plus days is definitely on the increase around here. However, a relatively recent innovation, the thin film solar panel, can operate up to 180º. They are less efficient and a bit more expensive than regular silicon panels, but at least they put out something in the Sonoran high summer. And scientists around the world are working on technologies promising up to 50% efficiency. Meanwhile, the federal and state government provide great incentives to go solar. You can find out everything about going solar at www.tep.com. In addition to the power grid, there’s the water grid and the sewer grid. The London district of Whitechapel has a nasty problem with the latter: Its sewer system is clogged with a 800 foot plug, composed of liquids like cooking oil, lubricants and solids like sanitary napkins, diapers and quick wipes. The liquid and solid waste has consolidated into an as yet unnamed substance much like concrete, except much ickier. It will take 8 men with heavy high-pressure equipment a month to break it apart. This plug, nicknamed the Fatberg, is particularly big, but they occur all the time. The annual cost to the Thames water company of cleaning up such obstructions is a million English pounds, about 1.3 million US dollars. The lesson to all of us is that greasy stuff and any tissue except toilet paper should go into the trash instead of down the drain. As for cooking oil, it can be recycled to make biofuel. You can find out where to take it and much more about recyclable materials at tucsoncleanandbeautiful.org. Contrary to popular wisdom, air is not what carries sound waves. Not unlike fire, sound waves are carried by just about any substance. While in air the speed of sound in air is about 900 feet per second, it travels at several miles per second in solids like concrete and steel. The lower the frequency, the longer the wave and the harder it is to stop. To absorb a wave with a frequency of 50 Hz, about the lowest note on a bass guitar, you’d need a wall with a width of half the wave length, which comes out to some 9 feet. The sound barriers along the highways are only 3 feet or less wide; they stop sound waves in the higher frequencies, but not the lower frequencies. A curious psycho-acoustical effect of that is that we hear the low-frequency noise more prominently. Numerous studies have shown that exposure to constant noise causes tension and stress, even if we don’t consciously register it after a while. Better alternatives are under study, but all of those have feasibility issues. So far, the best way to get some relief of the I-10 buzz is to put on your noise-cancelling headphones and tune to 91.3 FM. The KXCI Fall membership drive is in full swing! 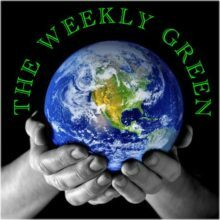 Keep your community radio station and the Weekly Green going! Call 520-623-1000 or pledge online at KXCI.org. The program airs on Monday 5:55 PM, Tuesday 4:55 AM, Wednesday 9:55 AM & 5:55 PM, Thursday 7:55 PM and Saturday 9:55 AM. Barring circumstances, first airing is Wednesday at 10 am.